In 1967, Odelle Bastion gets a new job in an art gallery, where the eccentric and enigmatic Marjorie Quick takes her under her wing. But when Odelle’s boyfriend brings a painting to be valued, Quick becomes even more mysterious, and Odelle becomes determined to discover the secrets. In 1936, Olive Schloss moves to rural Spain with her family, and they become involved with a local painter and his sister; and it is the events here that bring about the painting and it’s secrets. This was an exceptionally pleasing book. There is a feeling I get a few pages into a book when I know it’s going to be a good one; supreme smugness and anticipation of enjoyment, a relaxing and trust that the author is going to be trustworthy to take me on a worthwhile, enjoyable and satisfying journey. Like sinking into a hot bath, or the first taste of a truly terrific meal. It really wasn’t long into this book that I felt this feeling wash over me, and settled back to enjoy myself. For me, The Miniaturist had been a bit of a disappointment. It felt as though nothing was quite resolved; though it was compelling and interesting it could not quite hold together, and the end felt like a falling apart. This book took the good bits from that; the mystery, good characters, history and secrets; and presented them superbly. It felt more assured and more grounded; one trusted the author that she knew the secrets she was hiding. Each setting was fantastic. Both interesting periods of history, but neither overburdened with detail or in any way intrusive. Odelle’s London felt upbeat then contrasted with the stark quietness of the gallery. Spain felt big and empty almost; we see so few characters for the majority of the novel, it is an escape and a hiding place. Evidently the two time periods are linked by the painting and the story itself, but lots of themes echo between the two also. I seem to have read lots of books of split time periods recently and have grown a little bored of it, but here Burton achieved the links and echoes with class and subtlety, and also impressively made each section equally important to the reader. I often find myself disappointed to switch time period, but not here. Each contain a clash of cultures; Odelle’s experience as a black immigrant to London, rejected for jobs and generally discriminated against, whereas Olive finds herself a rich foreigner set against the rumblings of civil discontent. We also explore the creative process in both sections of the book. 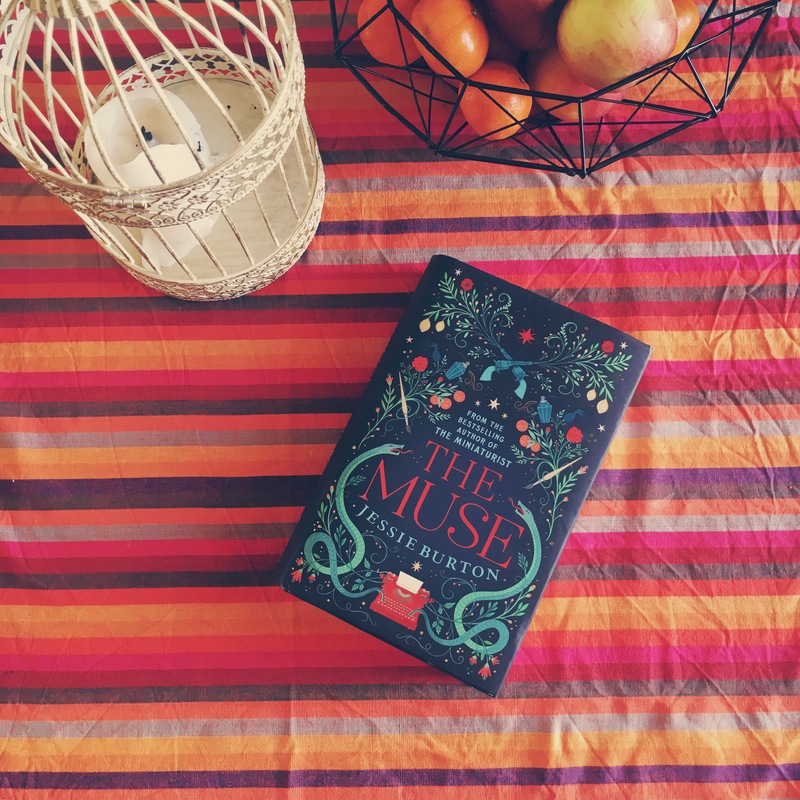 I think I read somewhere that Burton found this book difficult after the overwhelming success of The Miniaturist, and it would certainly fit with the themes of the novel: we see various characters struggling and succeeding with their artistic and literary endeavours. With the pressures of fame and anonymity, of creation, of expectation. Each of our main characters also falls in love and deals with their friendships. And the characters themselves are so well realised. I would have been happy if the book had been solely about either of them, but it was even more interesting to have them set against one another. The mysteries that we come across developed, evolved and emerged with a good pace; but it felt relaxed rather than rushed. To me, where The Miniaturist was rushed, intense and claustrophobic, this was spacious and clear. And yet, still compelling in it’s story. This is a very different book, but I think it is the fulfilment of the promise of her first one. And oh my, that cover! It is so very beautiful that I think I’ll have to keep it forever! It feels great too; a good chunk of a book with that strange velvety plastic texture for the cover. After my disappointment over The Miniaturist, I almost didn’t want to give this a go, but when I was asked by the site SocialBookCo which book I wanted to read the most, this was top of the list. Though I’ve not thought through a proper list yet, I’m pretty sure this would be a contender for my top books of the year. Thanks to SocialBookCo for the free copy, my opinions have been in no way affected by your kindness. SocialBookCo endeavour to provide the best prices for books on the internet: you can visit their site and see prices for The Muse here. If you happened to buy it, I would get a very small amount of money, to perhaps buy a single sweet.